Want to look like your younger self? Want to wipe off the effects of an indulgent weekend? Want to detox yourself from high energy indulgences? Then this tomato carrot juice is the correct place to start. Rich in beta-carotene, a precursor of vitamin A, and also a storehouse of antioxidants; both carrots and tomatoes are your allies to prevent free radical damage. Drink a glass of this refreshing juice every day for that pink cherubic glow on your cheeks and also a have an overall healthy glow in your body! Place all the ingredients mentioned above in a blender. 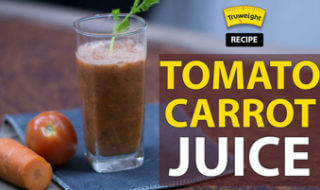 Blend them and serve a glass of healthy carrot tomato juice.